Heartland rocker. Hoosier hit-maker. Political populist. One-time “next Springsteen.” Farm Aid founder. Rock and Roll Hall of Famer. After 40 years and 23 albums, John Mellencamp’s place in the pantheon of late 20th century pop music is well established. But for the past decade or so, The Artist Formerly Known As The Coug has downshifted significantly, digging into raw American folk, blues and roots music. He started in earnest with 2010’s No Better than This, recorded with old-fashioned technology in historic spaces, and continued through 2014’s aptly named Plain Spoken. Mellencamp’s new album, Sad Clowns & Hillbillies, isn’t quite as slowly paced and sparsely produced as its predecessors, but it does further the man’s late-career move toward a space that’s about as far from pop stardom as you can get. This time, veteran country artist and longtime Mellencamp touring partner Carlene Carter is a prominent contributor, writing some songs, co-writing others and singing on several. 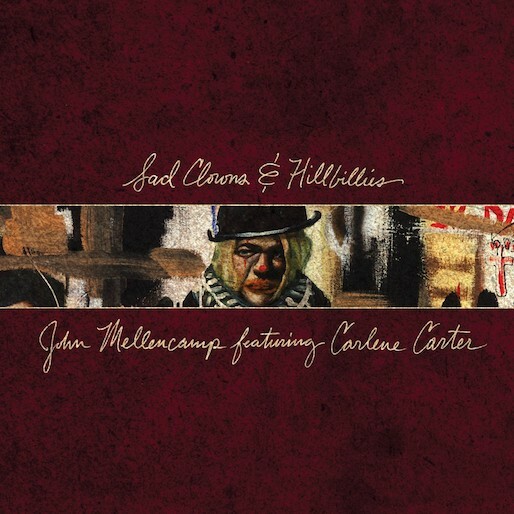 Early on, Sad Clowns sounds like Mellencamp’s version of The Mountain, Steve Earle’s excellent 1999 bluegrass one-off recorded with the Del McCoury Band. Opening track “Mobile Blue” isn’t exactly a traditional string-band jam, but it does prominently feature the whine of a fiddle and mandolin as Mellencamp tells a typical blue-collar tale. Next up, “Battle of Angels,” does the same while following a more familiar bluegrass groove. It’s one of Sad Clowns’ strongest moments. But just when you think Mellencamp might be retreating deeper into bygone sounds, along comes “Grandview,” an electrified blues-rocker (and duet with Martina McBride) that swaggers and smolders like something out of the man’s fertile mid-’80s period, which produced weighty hits like “Rain on the Scarecrow” and “Paper in Fire.” Mellencamp didn’t write “Grandview” all by himself (he shares the credit with his cousin, Bobby Clark), but he does inject it with a satisfying shot of gritty sincerity (and trailer lust) that ought to tickle any old Mellencamp fan’s hippocampus. That list that kicked off this review? Add to it: Perpetually underrated songwriter. Sad Clowns is proof Mellencamp still knows how to do it.